Windows 8 launched in 37 languages and 140 worldwide markets, as the tech giant unveiled the new version of its computer operating system. The OS is now available in over 30 certified devices, and a broad selection of local apps are already available in the onboard Windows Store. It is also available for download onto PCs and other devices running previous iterations of Microsoft's Windows OS. 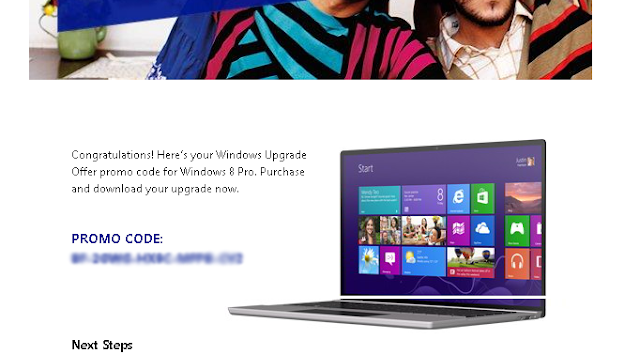 Microsoft is currently running a special promotion upto 31st of January 2013, under which you can upgrade to Windows 8 Pro Edition for a very small amount. If you have purchased / are going to purchase a Personal Computer which is pre-loaded with genuine version of Windows 7 (any edition), then you are eligible to get Windows 8 Upgrade (Pro Edition) for $14.99 (US Dollar) or £14.99 (British Pounds) or €14,99 (Euros) or INR 699 (Indian Rupees). But because of a flaw in website providing promo code, now anyone is able to get the promo code, using which user can updrade his windows with only $14.99 (even not really worth the $15 ). You just need to go to Official Website of Windows Upgrade Offer ( http://www.windowsupgradeoffer.com/en-IN )and select your country exactly. On the next page, hit the continue button and you will see a small registration page. 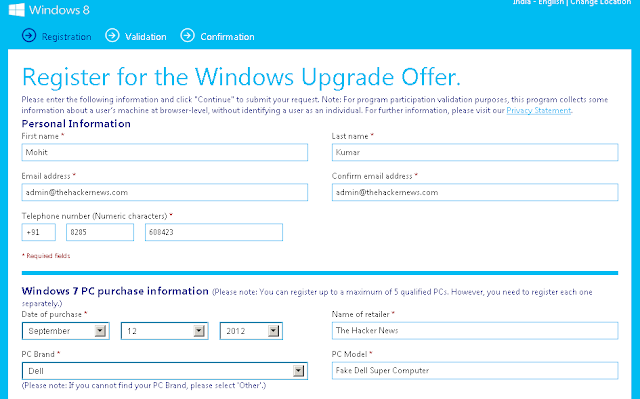 Now here we have the loophole, Windows Upgrade Offer page requires people to enter some extremely basic details about their Windows 7 PC purchase as shown above, I fill th form with all fake information (Date of purchase should be between June 2, 2012 and January 31, 2013). Because I am an Indian user there is no verification process that I really purchase such system or not, but for some countries, the page also asks for your Windows 7 Product Key for verification/validation purpose. Now download, install and run Windows Upgrade Assistance and on the final check out page, enter the Promo Code you received from Microsoft and your final purchase price will be reduced to $14.99 or £14.99 or €14,99 or 699 INR! Promotional offer period, which runs till Jan 31st 2013.